Menasha was carved from the northeastern Wisconsin wilderness in the late 1840s. At the confluence of the Fox River and Lake Winnebago, the town's early entrepreneurs and industrialists sought the promise of waterpower to fuel their mills and kick-start the engine of commerce. Taming the Fox with dams, canals, and a lock, Menasha initially made its mark with flour mills and lumber-based industry. At one time, the city was home to the largest manufacturer of wood-turned products in the world. In the late 19th century, however, the tides of change once again washed upon the city and industrial focus shifted to the paper industry. What made Menasha great were dependable waterpower, plentiful rail connections to centers of commerce in Milwaukee and Chicago, and a prolific labor force that coincided with an influx of European immigrants. Author David Galassie grew up in Menasha and, although he is no longer a resident, has never lost his love and passion for the city. 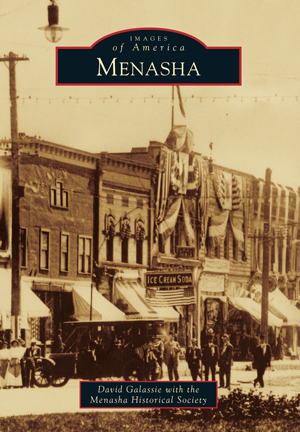 In association with the Menasha Historical Society and its wealth of vintage photographs, he presents the fascinating story of this industrial city.